From students to zookeepers, footballers to opticians, fundraising organised by Plymouth University for Brain Tumour Research has raised in the region of £7,000. 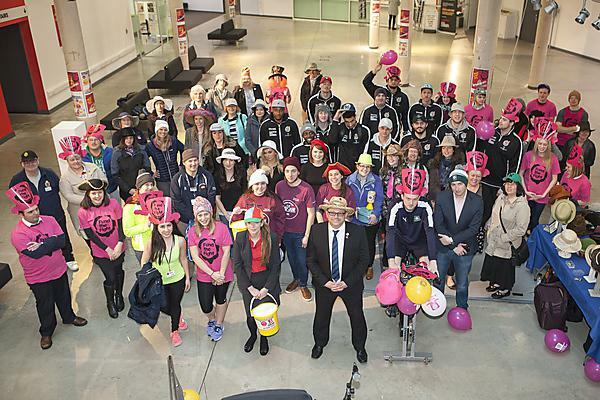 During Brain Tumour Awareness Month and on Wear A Hat Day on 24 March, the University arranged a variety of fundraising activities designed to support charity Brain Tumour Research and the University’s own world-leading research into brain tumours. Students ran around the campus throwing powder paint at one another in a Colour Dash; students, staff and visitors made donations via collection boxes on campus and at Plymouth Science Park; and local organisations Plymouth Argyle FC, Plymouth Raiders and Dartmoor Zoo also got involved. Fundraising which involved staff from Santander also attracted matched funding. The brain tumour research team in Plymouth are leaders in Europe for research into low grade brain tumours, which typically affect children and young adults. Their work focuses on identifying and understanding the mechanism that makes a cell become cancerous. They are exploring ways in which to halt or reverse that mechanism. An innovation will be testing new drugs in human primary cell cultures leading to innovative phase 0 trials. It is hoped this will be followed by adaptive phase II/III trials with the potential for making drug therapies available to patients safely and more quickly. If you would like to support research at Plymouth University, please visit www.plymouth.ac.uk/campaign, email campaign@plymouth.ac.uk or call 01752 588045. Your support can make all the difference.